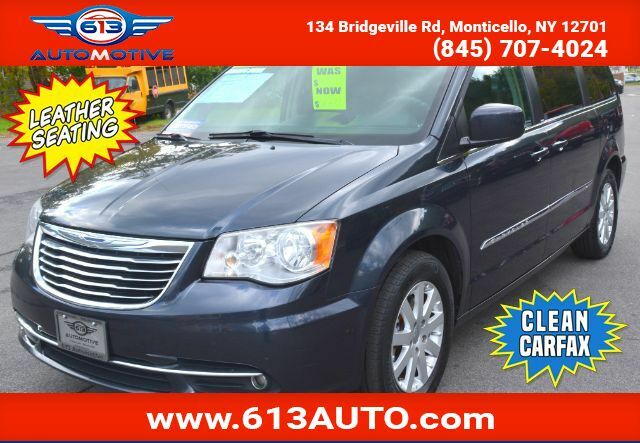 Family-friendly never felt so luxurious with our 2014 Chrysler Town & Country Touring shown in Brilliant Black. Powered by a proven 3.6 Liter Pentastar V6 that produces an incredible 283hp while connected to a smooth shifting 6 Speed Automatic transmission. This Front Wheel Drive will enhance fuel efficiency and offers near 25mpg as well as a smooth quiet ride that you''''ll enjoy whether cruising through the carpool lane or gliding down the interstate. The beautiful interior has cushy bucket seats and steering wheel mounted audio controls with SiriusXM as well as an upgraded sound system with a Uconnect touchscreen media center providing entertainment at your fingertips. With full power accessories, our famous stow-n-go seating, a power liftgate and dual power sliding doors you''''ve got an adaptable, practical, and an opulent minivan that makes traveling anywhere a delight. When carrying cargo as precious as your family, safety is of the utmost importance. Advanced multi-stage airbags, front and side-mounted airbags, a child seat anchor system and rear back up camera make our Town & Country the ultimate family vessel. Imagine what it can do for your daily routine! Print this page and call us Now... We Know You Will Enjoy Your Test Drive Towards Ownership!